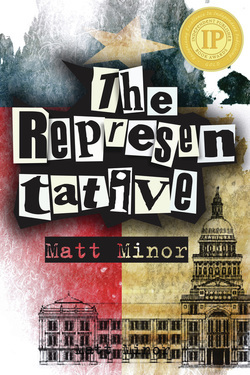 "Not many authors succeed in mixing genres, but Minor brings in the right amount of romance to offset any cynicism about the political process." ​and death and even a little romance. Buckle your seat belt and hang on for the ride." Following a horrific terrorist attack on the southern border, a handsome, charismatic former rocker and poet, John David (JD) Dothan unexpectedly wins his district in the Texas Legislature. After the freshman liberal is befriended by an influential colleague, Rep. Ron Martinez, he finds himself sitting on the controversial Select Joint Committee on Immigration Reform with his "first love," Pro-Life State Senator Rachael Logan. Together, JD and Rachael become the public face of the prestigious committee's contentious legislation. But the two are carrying not only the committee’s cause, but a destructive secret out of their mutual pasts' that could undermine it. Ever burdened with the stresses of family and business, the poet delves further into his romantic past; even if that past has the potential to undermine his future as a legislator. With the aid of his sharp but inexperienced Chief of Staff, Tryphena Taylor, he must navigate through a world where nothing is what it appears to be. Through a macabre twist of events that lead to a tumultuous rock bottom, Dothan is pulled not only towards the ugly reality of power, but his own redemption as well. When you're ready for a novel with a flawed but idealistic protagonist, a book that reads fast and makes you think about what might really be going on in our world, this is the one worth reading." ~ Chris Rogers, author of the Dixie Flannigan series, Here Lies a Wicked Man, Paradise Cursed and many more.